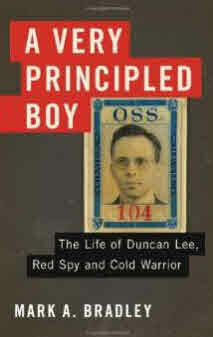 My review of A Very Principled Boy: The Life of Duncan Lee, Red Spy and Cold Warrior by Mark A. Bradley. Duncan Chaplin Lee offered this statement as part of his testimony before the House Un-American Activities Committee in August 1948. It was a lie; one he relentlessly repeated over and over to the FBI, federal grand juries, friends, family and anyone else who would listen to the day he died. America’s past was embedded into Lee’s DNA with a lineage stretching back to the arrival of the Mayflower. As a son of “Ole Virginia,” he often bragged about family connections with Richard Henry Lee, a signer of the Declaration of Independence; Light Horse Harry Lee, George Washington’s dashing cavalry commander and, of course, Harry’s famous son, the embodiment of the Confederate cause, General Robert E. Lee. His provenance was essential for him; when battling later accusations of espionage he would rhetorically question how a patriotic American with such rich blood-lines could conceivably commit treason. Lee was born in China and spent his childhood there as the son of missionaries. After completing Harvard College with honors, he sailed to England in 1935 where he studied for three years at Oxford University as a Rhodes Scholar. There he met Isabella Gibbs (Nicknamed “Ishbel”), an Englishwoman who became his lover, radicalized his political thinking, and gradually led him into the Communist Party. After returning to America in 1939 with Ishbel as his new wife, Lee enrolled at Yale Law School. Two years later this secret Communist went mainstream as a newly minted lawyer joining the Wall Street law firm of legendary war hero, William J. Donovan. Just months before taking up his new duties, Lee met a Russian spy from North Carolina named Mary Price who was working at the time for the KGB courier and future FBI double agent, Elizabeth Bentley. Price quickly recruited Lee into espionage, becoming his lover and first espionage handler at the same time. Later when she fell ill, Bentley assumed direct control of Lee. Following her defection to the FBI in the fall of 1945 she named Lee and dozens of other OSS officials as Russian spies. A few years later army cryptanalysts confirmed Bentley’s charges after uncovering his name and espionage connection in deciphered KGB messages. As pressure mounted from FBI and congressional investigations, Lee sought to reinvent himself as a Cold Warrior by signing on with Washington lawyer Tommy Corcoran and General Claire Chennault in the support of Chiang Kai-shek. For the remainder of a life spent in business, however, the lingering odor of Russian espionage and his repeated denials consumed him. Lee’s life is laid bare in an interesting new biography entitled A Very Principled Boy: The Life of Duncan Lee, Red Spy and Cold Warrior .” The author is Mark Bradley, a writer whose own life has some very interesting parallels with his subject. Both men studied law (Bradley attended University of Virginia), both were Rhodes Scholars and graduates of Oxford University. Lee was an intelligence officer as was Bradley who worked for CIA, OSS’s successor. He is currently a staff attorney with the Department of Justice. This is a well-researched book with impressive sources. In addition to archival material from libraries in both England and America, Bradley also gained the cooperation of Lee’s children who offered him full access to their father’s personal papers. He has made effective use of this material. The letters Lee wrote to his family before the Second World War, for instance, considerably illuminate the reader’s understanding of his development in these years. The major weakness in what is otherwise a compelling story is Bradley’s tendency to keep his CIA trench-coat still very much in evidence. Like many former spooks, the author admires Lee’s “chameleon-like personality” and his ability to “mold his personality to the situation” which the author considers a “talent.” Many in the intelligence community would disagree, describing it at best as a “disorder” and at worst akin to the treachery of the likes of Bob Hanssen, Aldrich Ames and Anna Montes. 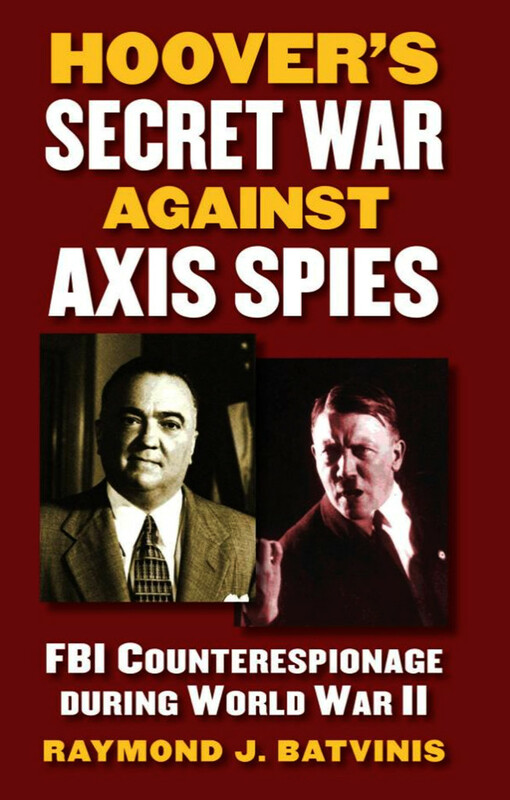 Then there is the author’s fixation and wasted pages on the evils of the FBI and legendary FBI director J. Edgar Hoover. 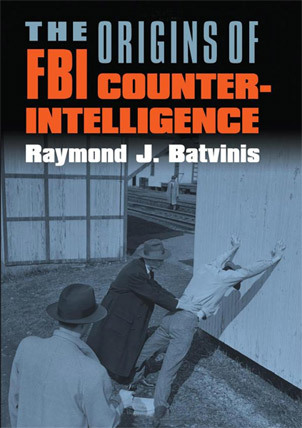 He goes on at length about the FBI’s “mammoth failure” in not uncovering soviet espionage during the Second World War while devoting one sentence to the fact that the American government was focusing all of its resources (including OSS), not against allies, but against the Axis powers. Bradley brashly calls Hoover a “psychopath” and a “fool” who victimized Lee. 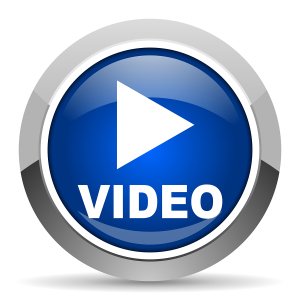 (Hoover had giant strengths and giant weaknesses. But a fool and psychopath he was not.) The FBI director’s refusal to let up on the investigation of Lee is attributed to a “pathological” need to destroy Donovan. A baseless charge with no evidence: Particularly for a DOJ attorney who should know that there is no statute of limitations on espionage. Then there is his soft peddling of Donovan who receives no criticism for his blind recruitment of Communists into OSS, dozens of whom were later exposed as Russian spies. Finally, in support of an acknowledged ambivalence about the degree of Lee’s guilt, the author turns to Arthur Schlesinger, the late historian and former OSS officer. Citing no evidence, Schlesinger absurdly claimed that OSS moles did little harm to US security and, in fact, may have advanced American and British interests by assuring Stalin that Roosevelt and Churchill were not conspiring against him. A very un-principled boy indeed! For espionage buffs and professionals alike this is a good read. Make sure you take a little pinch of salt before diving in.